For generations, the Midwest has been a fertile ground for producing talented jazz bass players. St. Louis native Jimmy Blanton revolutionized the role of the bass during his years with the Ellington band in the 1930s. Oklahoman Oscar Pettiford co-led the first bebop group (with Dizzy Gillespie) to play on New York City's famed 52nd St. And Ron Carter, born in Michigan, redefined the role of the bass in small group jazz during his tenure with the great Miles Davis Quintet of the 1960s. And while Bebop Generations bass player John Webber would modestly assert that he doesn't belong in the same league with legends such as Blanton, Pettiford and Carter, he is a prime example of the continuing stream of jazz musicians from the Midwest who have migrated to the jazz scene in New York -- and who help keep it going strong as the center for jazz activity in the world. "I was actually born in St. Louis," states Webber during a conversation from his New York City apartment. "But when I was three, my parents moved to Wheaton, just outside of Chicago. That's pretty much where I grew up and first got into music." By the time he was 10, Webber was taking lessons on bass -- but like most beginning students on the instrument, he started out on the electric bass rather than the large bulky upright. But that didn't mean he wasn't listening to jazz acoustic bass players. In fact, two legendary jazz bassists -- Ray Brown and Paul Chambers were his primary inspirations. "The sound that ray Brown could get out of the bass was just amazing to me," recalls Webber. "And he was so solid in his technique. And Paul Chambers had that great walking bass style, and was so great playing with Miles and Coltrane." By the age of 15, Webber had switched to playing the upright bass. After graduating from high school, he began serving his musical apprenticeship on the Chicago jazz scene -- working his way up to performing with top local musicians such as sax players Von Freeman and Lin Halliday and pianist Jodie Christian. 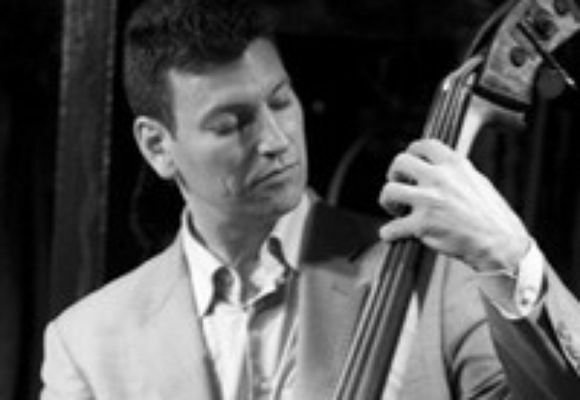 "That was where I really learned how to play jazz professionally," states Webber. "There were a lot of fine musicians playing in Chicago, and it was a competitive scene, because at that time there weren't a whole ton of places to play. So you definitely had to be good to play with the top musicians." By 1986, Webber decided it was time to make the move to the competitive New York City jazz scene. He had built a solid reputation as one of the top bass players in Chicago, and had built up some solid contacts through jobs backing touring musicians coming through Chicago. "It worked out pretty well for me," he recalls. "I moved to New York at the end of '86, and within a few months I was working with musicians like Jimmy Scott, Lou Donaldson, Bill Hardman and Junior Cook. And I was also playing regularly with groups led by Peter Bernstein and Christopher Hollyday." It turned out that Webber's connections with trumpeter Hardman and sax player Cook would have the most lasting impact on his career -- and the formation of Bebop Generations. Hardman, who was out of the harp bop tradition and had worked with Charles Mingus, Jackie McLean, Art Blakey and Horace Silver, hosted freewheeling jam sessions at his house every week. Webber was a regular participant, and it was at one of those jams that he met drummer Joe Farnsworth and sax player Eric Alexander. "When Joe got the leader's job at Augie's on weekends," recalls Webber, "he started asking me to play with his groups, and cecil Payne was a regular too. Eric had gone back to Chicago for awhile, but when he came back to New York, he started playing there. So that was really the roots of Bebop Generations." Although Webber has established himself as a regular bass player with Johnny Griffin's group and records with Horace Silver and other musicians, playing with Bebop Generations -- and musicians such as Payne and Alexander -- has a special appeal. "Cecil always comes up with some surprises whenever you play with him, plus he often plays things humorously," says Webber. "And Eric works you hard. He definitely plays with a lot of intensity. It's definitely a great band, and I want to keep working with these guys for as long as possible."